You must select one of the three shock kits from the drop down menu AND the proper springs. Not responsible if you select the wrong spring rate. Minimal modifications to be made. Remove the existing shocks and springs and the QA1 Pro Coil System bolts right in. These springs are designed so that the lower end sits on the coil-over shock's adjustable spring seat and the upper end sits in the original spring pocket in the frame. This allows for the use of a longer and lighter spring for more stored energy, offering increased weight transfer. Greater durability is also achieved by locating the spring pressure in the frame and not on a single stud. Ride Height Adjustable - Threaded aluminum body allows ride height adjustment. 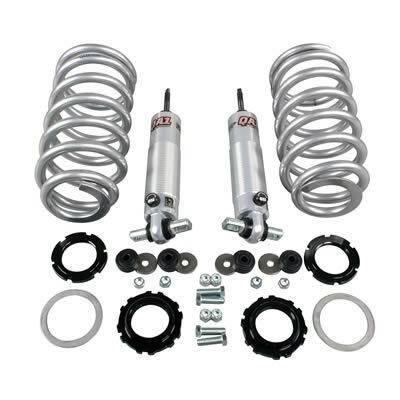 "R" Series Shocks - "R" Series shocks offer fixed firm compression with a wide range of rebound adjustment for front drag racing applications. Double Adjustable - Aluminum shocks with 324 valving options. Allows truly independent adjustment of compression and rebound. 18 positions of compression adjustment on one knob, and 18 positions of rebound adjustment on the other knob. Each knob is clearly labeled with an "R" for rebound or a "C" for compression, as well as plus and minus symbols for ease of adjustment. Not responsible if you don't select proper springs. YOU MUST SELECT THE PROPER SPRINGS FOR YOUR CAR BELOW! An easy way to adjust your springs. This spanner wrench set is needed to adjust the QA1 coil-over shock's spring seat. 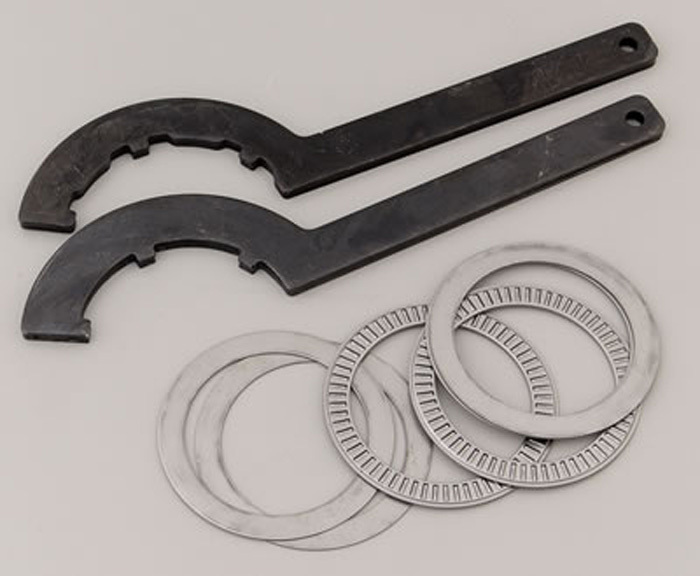 This kit also includes a set of thrust washers and torrington needle bearings to provide for bind-free spring movement and easy ride height adjustments. Kit includes parts to do two springs.